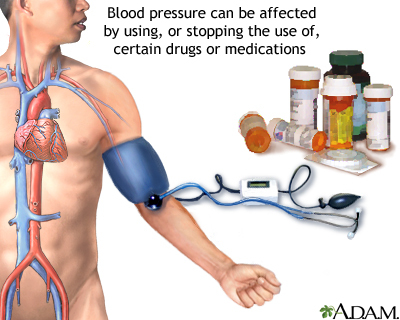 Drug-induced hypertension is high blood pressure caused by using a chemical substance or medicine. Essential hypertension has no cause that can be found. Secondary hypertension occurs because of another disorder. Drug-induced hypertension is a form of secondary hypertension caused by a response to a chemical substance or medicine. Rebound hypertension occurs when blood pressure rises after you stop taking or lower the dose of a drug (typically a high blood pressure medicine). Grossman A, Messerli FH, Grossman E. Drug induced hypertension--an unappreciated cause of secondary hypertension. Eur J Pharmacol. 2015;763(Pt A):15-22. PMID: 26096556 www.ncbi.nlm.nih.gov/pubmed/26096556. Jurca SJ, Elliott WJ. Common substances that may contribute to resistant hypertension, and recommendations for limiting their clinical effects. Curr Hypertens Rep. 2016;18(10):73. PMID: 27671491 www.ncbi.nlm.nih.gov/pubmed/27671491. Victor RG. Systemic hypertension: mechanisms and diagnosis. In: Mann DL, Zipes DP, Libby P, Bonow RO, Braunwald E, eds. Braunwald's Heart Disease: A Textbook of Cardiovascular Medicine. 10th ed. Philadelphia, PA: Elsevier Saunders; 2015:chap 43. Updated by: Robert Hurd, MD, Professor of Endocrinology and Health Care Ethics, Xavier University, Cincinnati, OH. Review provided by VeriMed Healthcare Network. Also reviewed by David Zieve, MD, MHA, Isla Ogilvie, PhD, and the A.D.A.M. Editorial team.